These Opals have very intense fire to them with a generous amount of Diamonds to compliment it. 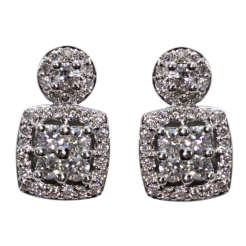 The total Diamond weight for these studs is 0.48ct by formula. The White Opals are excellent in Gem color and Gem quality. The stone are set in 14kt White Gold.